Khaled Jarrar and Sama Alshaibi are featured in a special pop-up exhibition of video and installation art at Brentwood Arts Exchange in Maryland. The American non-profit art space has organised Boundaries in order to investigate ‘identities and conditions that emerge as a result of fluid spaces that are geographic, political, and even metaphysical.’ Curated by Erin Devine and Phil Davis, this collective exhibition includes a diverse range of U.S. based artists, many whom are immigrants. 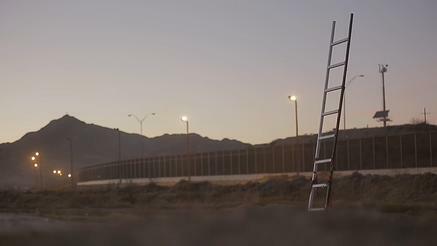 Jarrar will screen Khaled's Ladder (2016) a short documentary film produced in collaboration with Culture Runners that documents his site specific work at the U.S.-Mexican border. Alshaibi is represented with Tariqah (2016) a video work from her multimedia project Silsila (2009-2016), which is currently touring U.S. museums.